After 20 years in business performing basement waterproofing and over 25 years of experience in the field I’ve seen it all when it come to what works the best. These days it seems like everyone is a waterproofing contractor as entrepreneurs see it as a quick way to make a buck. Unfortunately with that philosophy most homeowners end up with less than desirable results to their problem. Most of the time they don’t even know if the repair was proper or not. I’m going to break down the three systems. The first system is the exterior system which when done properly when a house is built will usually last the lifetime of the home. It involves applying a damp proofing material to the exterior of the below grade foundation of the home. Drain Tile is placed around the exterior of the foundation which in most cases is placed below the top of the footing that the block/concrete wall is built on. With the drain tile at that elevation, the water will never rise above the footer which will in turn always keep the basement wall dry. These drain tile generally have clean outs or access points where the pipes can be jetted or cleaned out from silt and debris that will leach into them over the years. The most important part of this system which is usually the backfill of the foundation. This backfill should be gravel backfill preferably all the way to the top of the foundation, minus some topsoil at the top so you can have some landscaping and don’t have to look at gravel. The gravel should be a number 57 stone in either limestone or river stone. The gravel/stone provides proper drainage around the foundation where the water/moisture can drain to the pipe where it can be carried away. This gravel backfill is the step where most builder skimp and this creates a big problem. Building code in most areas only requires one foot of gravel, not all the way up. On top of this one foot of gravel they put the excavated materials back in from the excavation of the foundation which is usually impermeable clay soil here in Ohio. This is what causes the problem most of the time as this soil doesn’t let the water drain. The last part of the system is the outlet where all the water that enters the drain tile discharges. Most of the time this is a city storm sewer but in some case it can be a sump pump where the water is pumped up and out to somewhere it won’t re enter the foundation. Another option, if there’s enough grade, the water is drained to daylight. The second system is the interior waterproofing system. Called a waterproofing system but really should be called a dewatering system. This type of system is usually a repair for an older home and is more of a temporary fix in my opinion than anything. With this type of system, the exterior system is failing so this is a type of way to get rid of or hide the water. With this fix the concrete along the wall of the foundation is removed just enough where pipe can be installed below the floor. Holes are then drilled into the hollow blocks of the home where the water that is coming into the foundation can be diverted into the new pipe installed along the inside of the foundation wall. 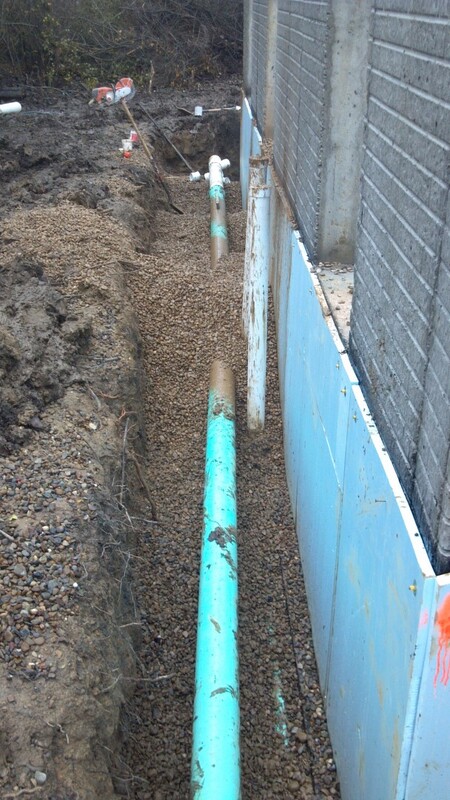 Some gravel is installed around the pipe and the concrete is replaced. Generally, with the interior system, a sump pump is installed in the inside of the basement where this new pipe along the interior of the foundation is discharged into and pumped outside. The third and final system I’m going to talk about is the combination interior/exterior system. This system is also not really a waterproofing system as often as it’s called by the companies that install them. With this system the interior portion of the fix is the same as the interior system above. The exterior portion of the system involves digging down to the frost line, which in Northern Ohio is approximately 3 feet, and disposing of the impermeable soil. At that point the foundation wall that is exposed is coated with a damp proofing material. A plastic membrane is installed that’s not supposed to let any water seep below this newly excavated area. Drain tile is installed and that 3 foot area of the exterior of the basement wall is backfilled with number 57 stone. This is my explanation of the three systems and in my next blog I’ll talk about the advantages and disadvantages of each one. I’ll also talk about what’s the best system for the long run and protecting the structural integrity of your foundation. If you have any questions about basement waterproofing, please feel free to call me.